In the Fall of 2015, the Baltimore Greenway Trails Coalition was formed. 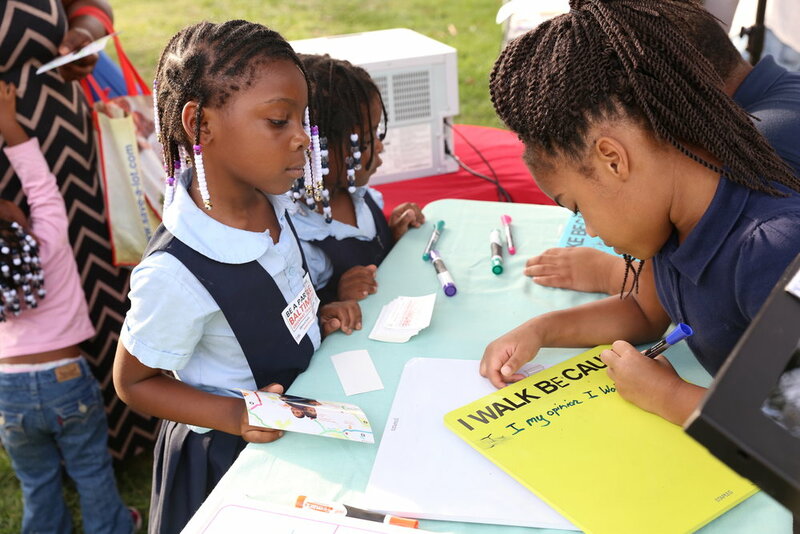 Funded in part by a grant administered by the American Planning Association, Baltimore became one of 20 cities to be recognized across the country through their competitive Plan4Health Grant. The grant has provided capacity building funds to help us do critical coalition building work — to create a collective vision for a 30 mile, multipurpose trail loop around all of Baltimore. The funding has supported staff positions at Rails-to-Trails Conservancy, Bikemore, and CPHA, technical assistance from national experts in public health and planning, and programming in the Greater Mondawmin area. As our grant funding comes to a close we wanted to both reflect on all that we’ve learned over this 18 month process and what we hope to accomplish moving forward. The vision for the Baltimore Greenway Trails Network--on street facilities and new trails to fill gaps in our existing recreation trail system that includes the Gwynns Falls, Jones Falls, Herring Run, and Middle Branch trails — is one we see championed in master plans across many different agencies and stakeholder groups. From the New Auchentoroly Terrace Community Association to the Baltimore City Office of Sustainability — plans have been created that aspire to provide better connections to our park system, improved access to recreation, and increased opportunities for folks to choose biking and walking as their primary form of transportation. This process laid bare how our communities most in need of increased access and opportunity are often asked repeatedly to be part of a planning process that has no real path toward implementation. Neighbors we have worked with have been asking for things like more traffic calming, better crosswalks, and more trails for decades. This tendency for community planners to inflict community engagement fatigue on our neighbors has to end. We must strive for resources that can be invested in tangible improvements, rooted in the community’s vision. That is one of the true strengths of the Baltimore Greenway Trails process. It’s a marriage of many existing plans — ones that did countless hours of outreach — and provides a clear path toward construction. Neighbors have become critical partners in refining the plan and helping to create awareness, but it was clear from the beginning that to spend neighbors’ time or grant resources on demonstrating need is wasteful and tokenizing. Despite sections of the trail being years off from construction, having a clear vision has also allowed us to influence planning decisions that are taking place today. Because of our work along the 33rd Street corridor, we were able to negotiate with Johns Hopkins University to ensure that private dollars being used to reconstruct a block of 33rd street between Charles and St. Paul incorporated many elements of future design plans. The improved block design not only provides state of the art accommodations for people who walk and bike, but improves safety for all users by reconfiguring turn lanes and straightening out travel lanes. This was in addition to ten coalition meetings that drew attendees from across city agencies, anchor institutions, the private sector, and neighborhood groups. As we move from the coalition building phase into the implementation phase, Bikemore’s role in the Baltimore Greenway Trails Network will evolve. We will be supporting Rails-to-Trails Conservancy’s efforts to engage neighborhoods in planning sessions, as well as advocating for continued resources and political support to make this vision become reality. Rails-to-Trails was able to leverage Plan4Health dollars into an award from France Merrick that will support the creation of 30% designs for all the on street gaps that currently exist in the plan. From there, the City has agreed to use these designs to submit for capital grants, such as Maryland State Bikeways dollars to go toward construction.